Oral Hygiene is as important for dogs as it is for humans. Recently, I was watching one of the morning news shows and they had a segment about how important it is to brush your dog's teeth to prevent diseases and how it could extend your dog's life by two years. They featured three dogs from a local shelter as examples of how to properly brush your dog's teeth. The dogs were not very receptive because they were not used to the routine of having their teeth brushed. It made us laugh because it brought back memories of when we started to try brushing Maxxamillion's teeth. He would bark at the toothbrush, grab it from our hands and take off with it as if it was one of his many toys. One of the things we did with Maxxamillion in the beginning was to start him out slowly by letting him lick the toothpaste on the tooth brush. Of all the popular flavored dog toothpastes on the market, we quickly found out that beef flavor was his favorite. We did that for a couple of days, and on the third day we were able to brush his teeth and he was more receptive to it. One of the tricks that we developed was to use two toothbrushes. First, we would brush one side of his rear and front teeth with one toothbrush, then show him the second toothbrush, and wait until his was through licking the toothpaste from his teeth. Then he would usually give us a nudge letting us know he was ready for the second toothbrush and we would then brush the other side. We would brush his teeth by preparing two toothbrushes with the beef flavored dogs toothpaste and this became a ritual every night before we all went to bed. 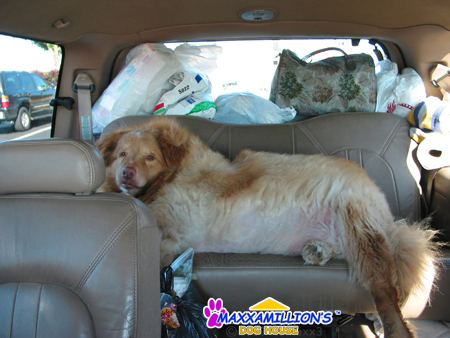 When we took Maxxamillion to the vet for his first teeth cleaning we found out that vet dental care can be very expensive and like most pets, Maxxamillion had to be sedated, and we didn't like having Maxxamillion sedated. It was after this visit that the vet suggested that we start brushing Maxxamillion's teeth at home. So as always, its never too late to start a good oral hygiene routine on your furry loved one.